Oh how the boys love going to the British School. They so often get to go in costume. 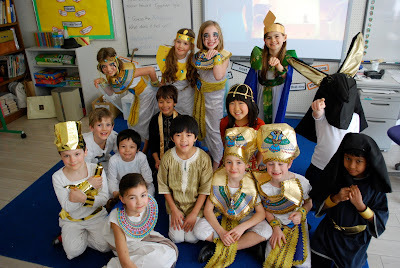 The Year 3's had Egyptian Day last week. They had a Bollywood-style Christmas party last term -- lots of embroidered tunics and scarves. For World Maths Day (March 3), the kids decorated themselves in numbers and symbols (in an homage to Brooklyn -- his "home country" -- Dylan taped multiplication problems to a "718" tee, Conor to his big P.S. "8" shirt). Japanese Day is next. Question is, will they be samurai or ninja...? Check out Anubis, middle row, far right. Awesome blog post. The yakisoba looks amazing. I will have to try to make it. I'd love to feature you as a blogger on www.pinkpangea.com - a site where women travelers exchange travel advice with the experts–other women travelers. Send a picture of yourself in Japan and related insights to rachel@pinkpangea.com.